Science fiction isn’t about predicting the future, it’s about commenting on the present. 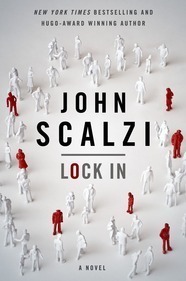 And with his latest novel, Hugo winner John Scalzi really nails the present. Plagues, riots, discrimination, evil Internet billionaires, Tea Partiers and hackers — they’re all here. Due to massive government spending the Haden’s victims are able to function, thanks to neural implants and android bodies, called threeps after C-3P0. The human bodies are tended in hospice care, while the Hadens are free to live through their threeps. But the government spending is due to dry up thanks to a Congress hostile to public assistance. Hadens are rioting, arguing they are facing discrimination. Against this backdrop rookie FBI agent and Haden Chris Shane and his hard-boiled partner Leslie Vann get involved in a murder investigation involving an “Integrator” — a human who can host a Haden’s conscious in place of a threep. The story is brisk and Scalzi’s writing is immediately accessible, humorous and entertaining, but ultimately not earthshaking. Shane is a bit too perfect — as are most of the good guys. The child of a fabulously wealthy, entrepreneurial basketball hall-of-famer with political ambitions but a philanthropist’s heart, Shane grew up the poster child for Haden’s Syndrome. Chris’s roommate is an ethical hacker with a generous, open nature and an eye for code. Vann has a traumatic past, but is still able to solve the crime. Shane also possesses an “unlimited gold” cheat code. Whenever a problem arises, Chris’s wallet solves it. When visiting the West Coast and the only threep available for his use is paraplegic (a delicious idea! ), Chris just rents one for the day. Chris’s threep gets damaged in a gunfight? Buy a new one. This keeps the story moving but it also makes Chris a bit of a Mary Sue. That being said, Scalzi offers withering and pointed commentary on contemporary society. Before a march on the Capitol threeps dressed in revolutionary garb show up to defend the Haden’s second amendment rights, and a giant public works projects on the Navajo Reservation sit idle due to lack of funding and empty government promises. Prejudice surfaces extensively, and an exchange between the owner of a Threep manufacturing company and a drug company working on a cure for Haden’s echoes arguments that I have read from the deaf community concerning cochlear implants. Of course Scalzi’s books always feel like the present. Look at Old Man’s War. It is set in the distant future where Earth has colonized the galaxy and immortality is essentially possible through cloned superhumans, yet it’s still showcases small town life not unlike the present, until its elderly protagonist leaves to join the colonial military. Lock In feels like 2014 with self-driving cars and robots. Hell, the Phoenix Suns are still not winning the championship! Although the Washington Wizards are, so there’s some futurist optimism. Lock In doesn’t have the heart of Old Man’s War, or the sheer meta audacity of Redshirts, but it is an entertaining story that should have come out three months earlier for a great summer read. And it could easily follow both of those previous novels onto TV or the big screen. Readers might also want to check out Unlocked: An Oral History of Haden’s Syndrome, a novella outlining the background of Haden’s Syndrome, available to read at Tor.Com. Reminiscent of Max Brooks‘ tremendous World War Z, it provides an excellent introduction to the world of Lock In. And for a true multimedia experience, read it while listening to the book’s theme song. Recently I read a blog post from Scalzi that referenced something I did not notice in Lock In — that he intentionally never addressed Chris’s gender or sexuality. I’ll be honest, I read the character as male, but looking back I can see that was my own projection on the character. Likewise, Chris’s race is never addressed. This I immediately noticed, and felt uncomfortable in my automatically assigning an African-American background on the character, simply because his father was a basketball player. So, by creating a truly faceless character, Scalzi is forcing the reader to confront their own prejudices. As a result I’ve bumped the book up one star. This entry was posted in Four Stars, Reviews and tagged android, cyber, disability, Hugo, John Scalzi, Lock-In, Mary Sue, Max Brooks, Michael Senft, Old Man's War, plague, political thriller, Redshirts, Relentless Reader, relentless reading, relentlessreading.com, review, Sci-Fi, The Relentless Reader, Unlocked. Bookmark the permalink.